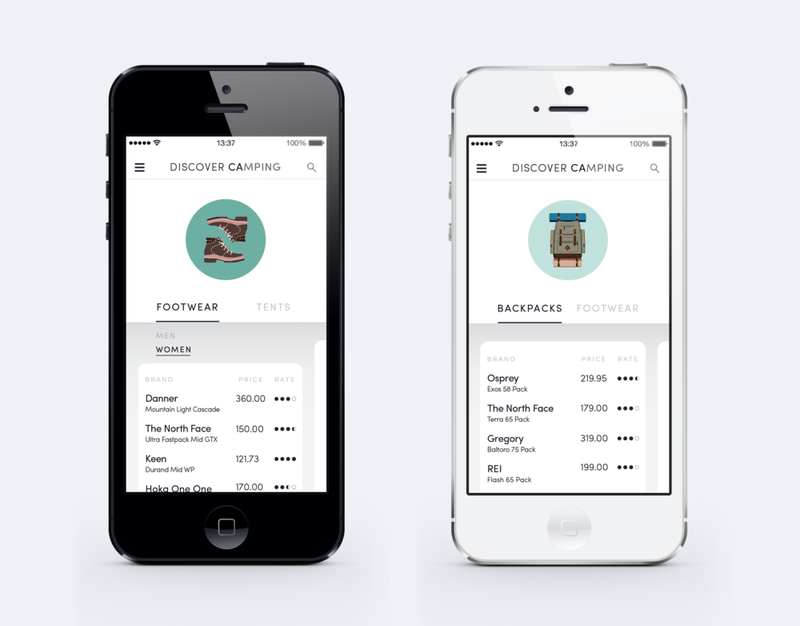 The purpose of this application design is to help a consumer be conscious of their spendings when purchasing gear and accessories for camping or outdoor adventure. Its focus is to be user friendly because of the simple navigation process via buttons and menu. Icon Ideation: Wanderlust is the lust or desire to travel. When creating & designing "Wanderlust", classic travel imageries came to mind: camping and adventure (i.e. : hiking mountains in gear and sitting around a bonfire with a hot mug in hand). This has helped in the design process for visualizing the objects as icon forms in terms of color, structure, and detail. Main focuses for strategically designing my icons were making sure to emphasize the form of the objects by using solid shapes but adding detail to them to create more three-dimensional forms. To visually develop these marks further, colors that reflected the outdoors were picked (earthy tones and the contrast of warm/cool colors). Application Design: The assumption is that many consumers have a habit of buying products when images are shown due to the influential looks of it. By eliminating that factor in the initial stage, the user will then be able to look at the price and rating before clicking on the brand listed to view the image. On the more interactive side, the user will also be able to use swiping features by swiping downwards or sliding to the right, where the next product type will be available to look at. Once he chooses a product, then the icon I have designed for that particular item will appear (as featured above). Because the icon design is already really detailed, balance was added by designing the application as easy-to-use and minimal. That is a grayscale color theme and Sofia Pro (clean look) as the font type were chosen. The hamburger menu is there if the user wanted to look at and choose certain product types. The user is free to search for items as well.